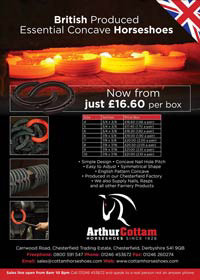 The Industry Suppliers Product Information page is kindly sponsored by Arthur Cottam & Company (Horseshoes) Ltd the independent 5th generation British family owned horseshoe manufacturer and distributor of farrier supplies within the UK and Worldwide. England Sponsors and an Exciting Open Day! Arthur Cottam & Company are Proud Sponsors of The England Farrier Team 2012/13 and wish them every success this year in all there endeavors. Congratulations to all the competitors that were at the England Trials and a very well done to those who successfully qualified. Steven Beane, Matt Randles, Jon Atkinson , Gavin Golby and Matt Randles with the reserve Ben Casserly. A big thank you to the Organizers especially the Army at Melton for hosting the event and Nigel Fennell Team Manager for the professional way the event was organized. 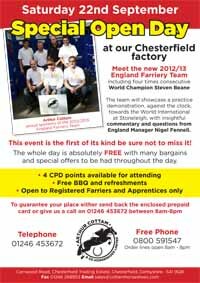 Cottam's will be holding a special Open Day with the England Team on September 22nd 2012. Click on the image to the right for further details. Find us on Facebook www.facebook.com/cottamhorseshoes Take a look at our photo gallery! Farrier's Formula® provides the needed nutrients to build healthy hooves, and is recommended by veterinarians and farriers as the gold standard for hoof supplements. A strengthened hoof wall means less shoe loss, reduced hoof sensitivity, and increased comfort on hard ground. Positive results can be seen within 8-10 weeks. Horses love the taste! For the Ultimate Hoof Care Combination, add either The Right Step® Hoof Conditioner to protect the hoof from excessively wet or dry environmental conditions or apply Life Data Hoof Dressing™ to protect from the hoof-eating microbes that are associated with cracks, White Line Disease or Thrush. Never apply a product to the horse’s skin that you would not apply to your own skin! 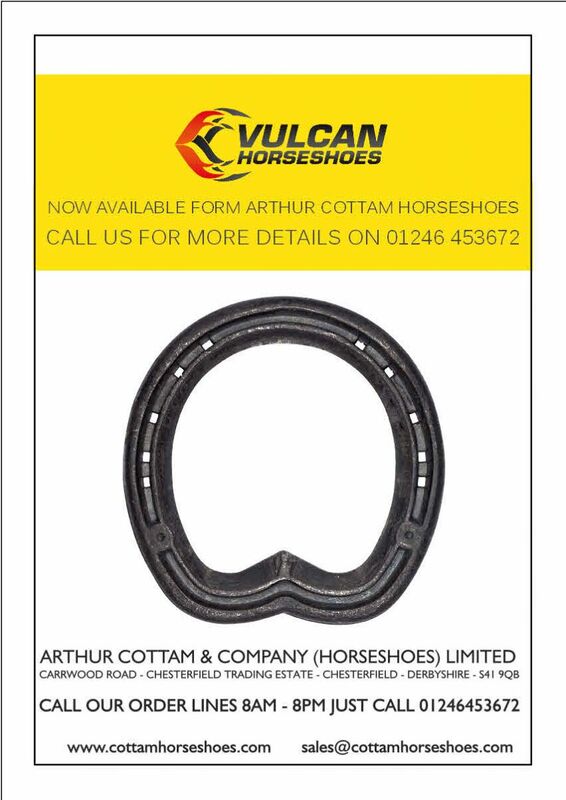 Cottam's are delighted to confirm that they now carry a range of Vulcan Straight Bar Shoes. Please do get in touch for further details and prices or call in to see for yourselves! 10% off JHM Anvils in July & August with Handmade Shoes (UK) Ltd! Handmade Shoes is proud to represent JHM Anvils throughout Europe. 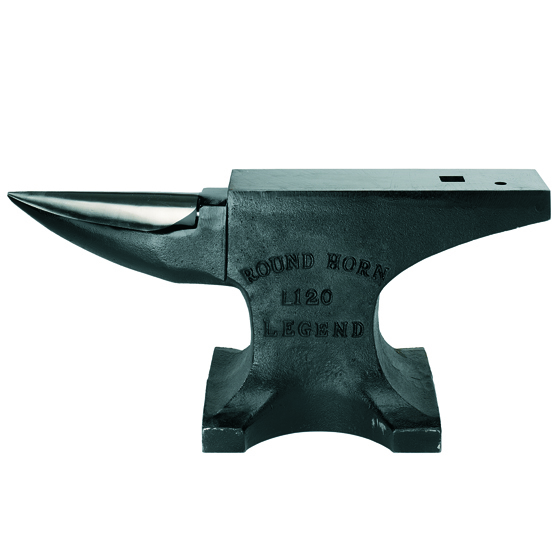 The best-selling anvil in the USA, JHM Anvils have been cast and carefully machined by hand in Texas since 1983. Traditional London pattern probably the best shop anvil available with crisp edges, machined flat face and a perfectly symmetrical round horn/bick. Compatible with the HMS Shop Stand. Traditional London pattern the Legend is a scaled down version of the Competitor with crisp edges, machined flat face and a symmetrical round horn/bick. New to Europe this year and already becoming a popular choice, weighing 120lbs the Legend is a very solid travel anvil. Compatible with the HMS Travel Stand. To view our entire range visit the new Handmade Shoes Shop. 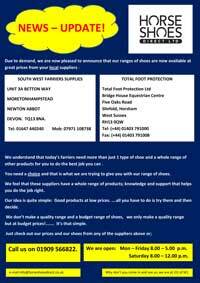 Due to demand farriers will now be able to get our shoes at great prices from either of these 2 suppliers. South West Farriers Supplies and Total Foot Protection. Long gone are the days when 1 type of shoe fits all. 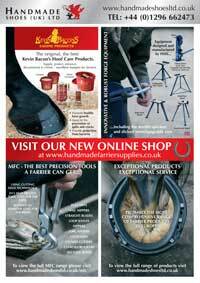 Farriers need a choice and whole range of products. We believe these suppliers can give the farriers that wide range of products, knowledge and support that is needed. All we are doing is trying to give people a choice. We are open: Monday to Friday 8.00 a.m. - 5.00 p.m. and Saturdays 8.00 a.m. - 12.00 p.m.
Only available to mainland UK, excludes orders of anvils, forges, steel and coke. 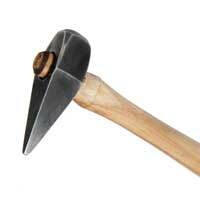 Jon Atkinson Tools available from Handmade Shoes (UK) Ltd! Precision Tools for the Professional Farrier. Finally the time has arrived for you to be able to use the innovative range of farrier tools designed, made and used by Jon Atkinson DipWCF. England Open Farrier Team Member 2009, 2010, 2011, 2012, and current BFBA National Champion 2011. To view the entire range visit the new Handmade Shoes Shop. 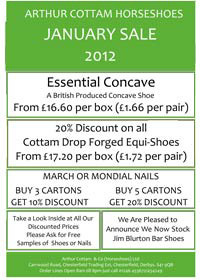 British produced Essential Concave Shoes from just £16.60 per box, discount on Mondial and March nails, plus special offers on Cottam Prestige Concave Shoe! Click on the image to the right to find out more! Designed by Arnaud Gidel, a top French farrier, Arnaud and his team have been making aprons for many years . They have gained knowledge and experience in manufacturing lots of different styles of leather and canvas aprons, including bespoke aprons for some of the worlds top farriers . Arnaud has used all that experience and knowledge to produce an apron that is suitable for most working farriers. THE FUSION farriers apron has many unique features which make it one of the most comfortable, practical and protective aprons on the market . 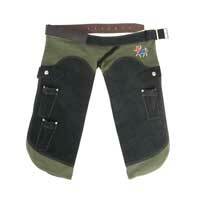 The waist can be fastened or altered by either buckle or Velcro. These stylish, comfortable, hardwearing aprons are the ultimate in farrier protection and are manufactured in 4 colour options - blue, green, black and pink . With all that these aprons offer in the way of added protection, when you first try them on it feels like your wearing an old favourite pair you've been wearing for years ! FUSION FARRIERS APRON by HOOF DESIGNERS - stylish, practical, comfortable protection. BAZ Hoof Knives available from Handmade Shoes! Designed by 3 time World Champion farrier Darren Bazin, Baz Knives offers you the complete range of high quality hoof knives. 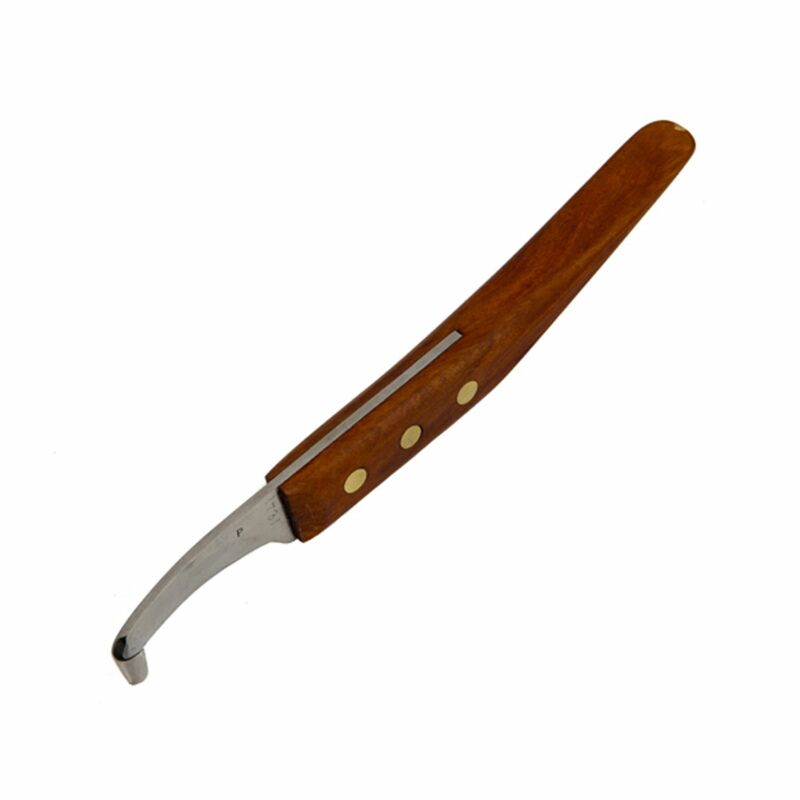 Precision polished blades fitted with a comfortable rosewood handle make BAZ knives a perfect choice for every day use. Both straight blades are excellent for trimming sole and frog, the curved blade is ideally suited for cutting in clips and general tidying. Both large and slim loops are perfect for frog trimming and sculpture , the slim will enable you to get in to a smaller narrower hoof. The vet searcher is invaluable when a foot search, and location of abscesses are required . BAZ KNIVES - THE PERFECT CHOICE ! 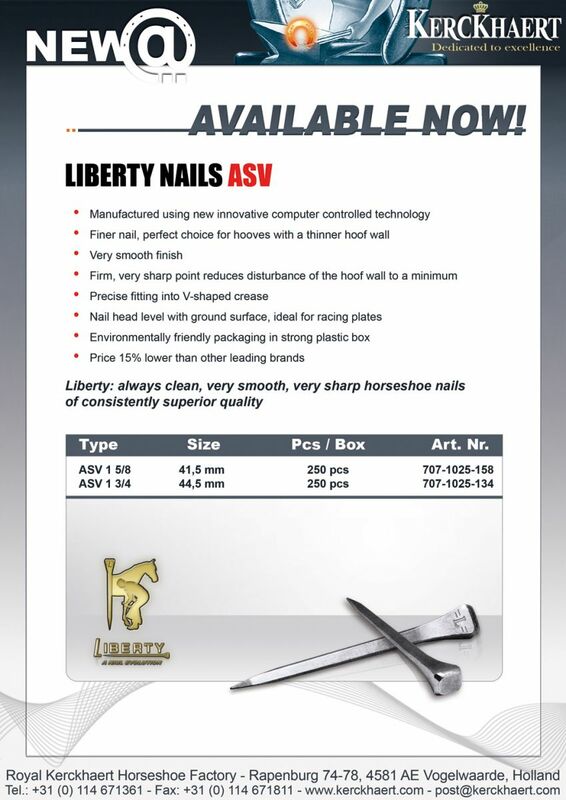 Liberty ASV race plate nails, the perfect match with the Kerckhaert aluminium race plates ! Products available in the UK from Stromsholm Ltd. NOTE - the Refurbishment package prices (as on the leaflet) are discounted for the offer period also (between 1st June 2012 and 20th September 2012) whilst the Refurb competition is running. 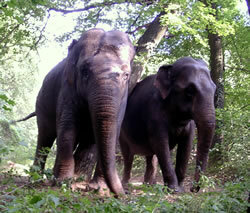 In 2008 Life Data Labs developed a concentrated version of Farrier’s Formula®. The nutrients in Farriers Formula Double Concentrate important for healthy hooves are provided at twice the concentration of original Farrier’s Formula. Farrier’s Formula Double Concentrate is now available to professional farriers and veterinarians at special pricing for resale to the horse owner. 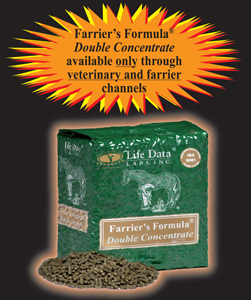 Farriers Formula Double Concentrate is the result of reformulating original Farrier’s Formula by utilising less alfalfa and a more concentrated natural flavouring. The nutrients important for a healthy hoof are provided at twice the concentration compared to our original Farriers Formula. The palatability of Double Concentrate rivals original Farrier’s Formula. The Double Concentrate 5 kg bag or pail will supplement the horse twice as many days as the original formula. For example, the average size horse receiving 1 cup per day of original Farrier’s Formula will receive ½ cup per day of Double Concentrate resulting in a two month supply compared to a one month supply of original Farrier’s Formula. With Double Concentrate, the combination of reduced shipping, handling, and packaging costs translates to less daily feeding expense for the horse owner compared to original Farrier’s Formula. You can assure your clients that Farrier’s Formula Double Concentrate is equally effective as original Farrier’s Formula with the added benefit of being more economical to feed compared to original Farrier’s Formula. Approaching the Easter weekend, Imprint Equine Foot Care conducted another one day training course at Aldington Vets in Lancashire. Eight farriers and two vets participated in the day focused on ‘Farriery for the Laminitic Equine’. The morning sessions at the veterinary clinic were lectures and discussions led by Dean and Andrew. The opportunity for vets and farriers to debate and exchange experiences was really useful. 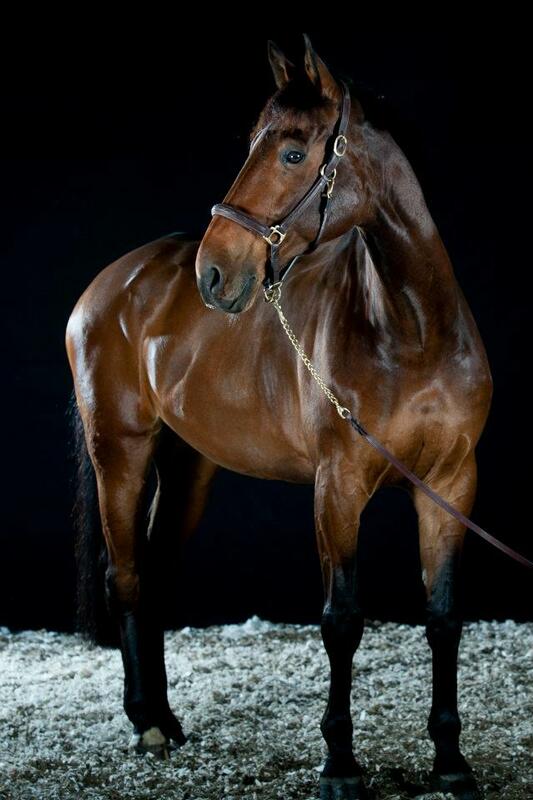 Subject matter covered the basic mechanics of laminitis and practical ways of treating this debilitating condition. The morning was concluded by David Aldington, our host for the day, who discussed the histories of the cases to be treated that day along with recent radiographs. The posse of farriers and vets then travelled in convoy up hill and down dale to a yard on rocky outcrop above Accrington. A sumptuous lunch was laid on at the home of the owner of the horses before we got down to the practical demo and hands on sessions. The horses presented each had their individual challenges. The one chosen for the demonstration had severe chronic changes to his feet, so provided material for radical hoof remodelling guided by current radiography, then partial hoof reconstruction followed by the fitting the Imprint shoes. The farriers worked together in pairs for the remainder of the afternoon on the horses with guidance from Andrew and Dean. All considered it a worthwhile day. This day, one of 115 CPD (Continuing Professional Development) courses run since our first in 2001 marked our 700th participant’s involvement. Our thanks go to all the farriers and veterinary surgeons who have attended over the years, who reassure us that we do have an industry that is progressive and open-minded. These days are often regarded as a ‘busman’s holiday’, great interaction and we all learn from each other’s experiences. From the early days which focused on fitting the shoes to laminitics, the courses have now developed to include both theoretical and practical elements covering diverse areas of farriery, from foal development to coping with the geriatric horse, all utilising contemporary materials. As well as gaining further skills and knowledge participants gain 4 CPD points. It would be remiss not to thank farrier and friend Dean Bland from Yorkshire at this point who has been invaluable in assisting Andrew in tutoring on these courses for many years now. They have not only conducted courses in most regions of the UK but have travelled to the USA and European countries too. Shoeing Problem Feet and Limbs for Soundness. The FEI World Cup Finals 2012 were recently held in the Netherlands. In addtiion to outstanding performances by horse and rider, Kerckhaert shoes and Maddoc and Liberty nails could be found on 87% of the World's best horses. Click on the flyer to the right for more information. J & A Ferrie are pleased to announce that they are now stockists of Jon Atkinson Farrier Tools. 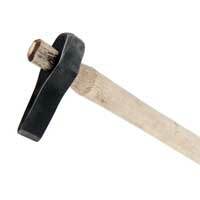 This exclusive tool range is Handmade & Finished by Jon in his Yorkshire forge to the highest of standards. The full range can be viewed and purchased on our online shop at www.j-aferrie.com or call 01560 323002. 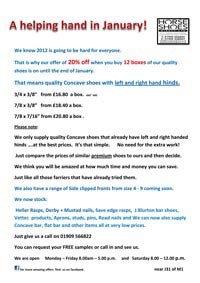 Handmade Shoes (UK) Ltd are delighted to announce the launch of their brand new online shop – www.handmadeshoesltd.co.uk. Built to provide our clients with the ability to view, and order, our entire product range online, handmadeshoesltd.co.uk is an easy to navigate website offering a slick order process available at the touch of a button, day or night, supported by an efficient and effective Customer Services Team. To view prices you will need to register first to receive your username and password – this is to protect your registered farrier status. Click here to register now. Please allow 2 working days to process your application. This is the first stage of the web shop, the second stage will include the processing of payment online and the ability to view order history and re-order ‘regular’ products in addition to gaining Loyalty Reward information. 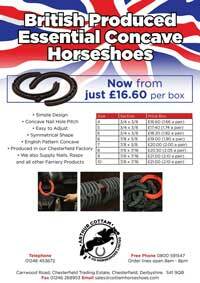 British Produced Essential Concave Horse4shoes from just £16.60 per box! 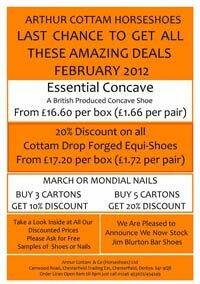 Plus Offers on the Cottam's hardened Steel Anvil, Equi-Shoes and Mondial and March nails! Click on the image to the right to find out more or get in touch using the contact details below! A revolution in chap design. Have you ordered yours yet? 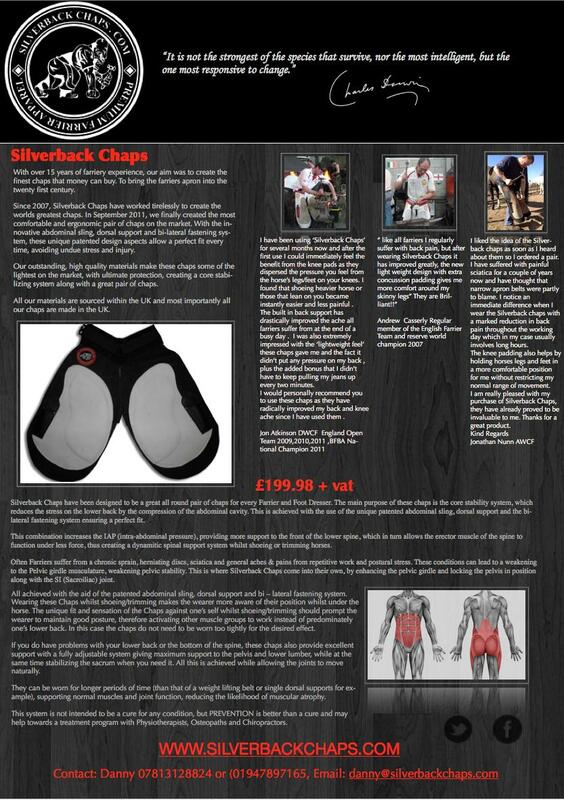 Silverback Chaps have been designed to be a great all round pair of chaps for every Farrier and Foot Dresser. The main purpose of these chaps is the core stability system, which reduces the stress on the lower back by the compression of the abdominal cavity. This is achieved with the use of the unique patented abdominal sling, dorsal support and the bi-lateral fastening system ensuring a perfect fit. 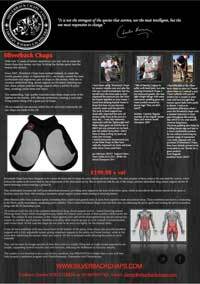 An exciting new product on the market, endorsed by leading, internationally renowned, farriers (click on the flyer to the right to read more or visit their website). Horseshoes Direct - All Summer Sale!! Introducing (the BRAND new) concave side clipped fronts from only £21 a box and our Quality Concave shoes now from £16 a box ! This special offer is going to be All Summer long. We also have 10% off Mustad Nails and great offers on Derby nails,Rasps and other items. For full details please downloads the flyer to the right. Check out or Special Offers for March. Because of the popularity of our Cottam Essential we have managed to keep our prices the same for another month to help in these difficult times, prices from Only £16.60 per box . 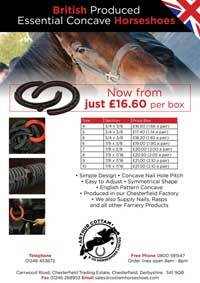 Equi-Shoes Eco only £19.00 a box plus fantastic offers on Nails and Anvils. If you need to take a look at any of our shoes or nails before buying just ring Jane 8am till pm on 01246 454249 for free samples. Just click the image to the right to take a look at all our offers available for March. 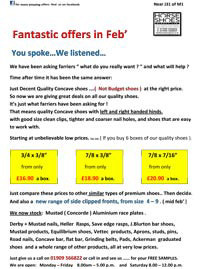 Horseshoes Direct have Magical March Offers for you! 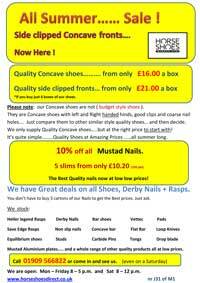 10% off Mustad Nails PLUS great prices on Derby Nails and our Quality Concave Shoes from only £17.00 a box. If you have a horse that could benefit from wearing hoof boots for a while, then we recommend that you buy before Friday 16 March. After that date, the boots will no longer come with a free pair of pastern wraps and gel pads - these will be charged separately if required. The special farrier price of £62.50 + VAT (RRP: £99.00) will remain in place, however. Please telephone us with your Farriers Registration No.to hand to secure this price - if you order online, you will be charged the full retail price for obvious reasons. J & A Ferrie invite you to come along to their open days on 29th, 30th & 31st March which is running in conjunction with the Ayrshire Branch competition. 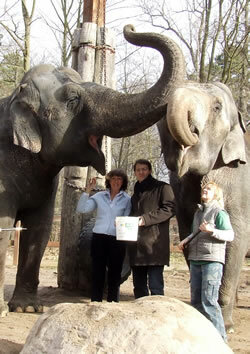 We will be offering a 10% discount on all products purchased on 29th, 30th & 31st March. As well as our fab offers and discounts our competition sponsors will be displaying their products and will also be on hand to give advice and answer any questions. View, buy and have your order delivered to your door all in the comfort of your own home! 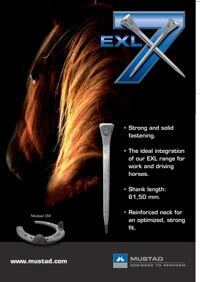 The ideal integration of our EXL range for work and driving horses. Reinforced neck for an optimized, strong fit. Download the flyer to the right for further information. 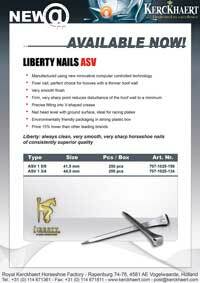 The new Mustad LIBERO ARCTMnail is the innovative nail for today’s hoofcare professionals. Its newness both in terms of functionality and design embodies the “form follows function” motto at its full. The ARCTM head design, another innovation newly introduced in our nail range, sets Mustad further apart from competition. Mustad PitchTM technology, already successfully tested on our Concave nail, offers a small angle between nail head and shank of the nail, helping drive the nail at a correct angle i.e. parallel to the hoof wall. Mustad PitchTM contributes therefore to reducing possible pressure on the hoof wall. The shank is smooth, tapered, slim, strong and at the same time flexible for perfect clenching to keep the hoof wall intact. Mustad LiBero ARCTM nails offer an optimal fit - and therefore are highly recommended - in conjunction with the new Mustad LiBero horseshoes. USP’s next generation race plates, a plate evolution! 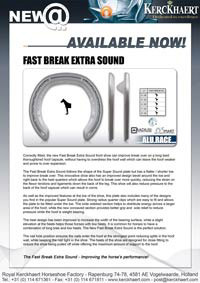 Read all about the new Fast Break ES, Safety TrackX ES and the Super Sound plus lots more in the Kerckhaert Newsletter. 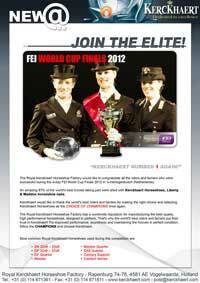 Click on the image to the right or click here to download the newsletter. Today Mustad, the world leader in hoofcare products, including horseshoes and nails, announced the consolidation of its global hoof nail production in Mustadfors (Sweden) and Emcoclavos (Colombia). The closure of the Capewell production facilities in Bloomfield has been announced on Feb 21st, 2012. “We are continuously looking for ways to improve our production, distribution and customer service,” says Hans Mustad, CEO of the firm. “After a careful and thorough evaluation process we have decided to close the nail production at Capewell and move the entire Capewell production to Mustadfors, Sweden." In Bloomfield a total number of 26 employees are affected by the closure. “All agreements with our staff are made in the spirit of Mustad´s values as a family company, with a 180-year tradition in social responsibility,” confirms Hans Mustad. The North American sales and customer teams are not affected and remain unchanged. “We are very grateful to the Bloomfield employees for their dedication and craftsmanship in producing Capewell horsenails. Their efforts have been instrumental towards maintaining Capewell's 131-year reputation for exceptional quality with suppliers and customers from around the world. We will continue that positive legacy as we transition to the next phase of Capewell's future” confirms Petter Binde, Mustad’s Sales & Marketing CEO. The Capewell brand will remain unchanged and continues to be an integral part of Mustad´s market leading, global product offering. Mustad is proud to introduce the new SWIFT® racing nail. Developed through a close collaboration with farriers specialized in racing disciplines, Swift® meets the specific needs currently expressed by racing professionals. Swift® offers a better fit with racing shoes, particularly steel shoes. It represents an ideal match for the St. Croix Forge Concorde shoes (both steel and aluminium) as well as many other aluminium racing shoes. 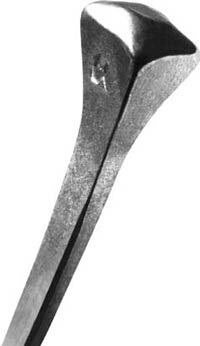 The competitive advantage of the Swift® relies upon its unique combination of head and shank that no other brand can offer in the racing segment. 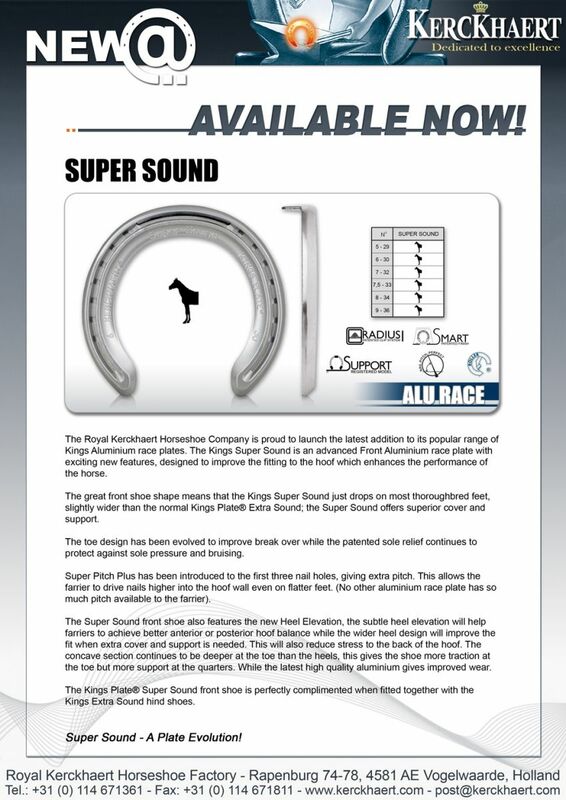 On top of that, extensive testing prior to the official market launch has highlighted specific points of strength for Swift®, among which the most notable ones are the excellent durability and resistance to wear, the shape allowing for different styles of nailing, especially important on thin or fragile hoof walls, and the ease of driving. The new Mustad LIBERO is a 3/4 fullered all-round horseshoe based on feedback received on our very successful LB range. We like to think of it as an upgrade on our base range, making it suitable for most leisure and sport purposes with a wide variety of sizes and sections. It has been designed thanks to the collaboration of an extended farriers team, formed by eminent specialists from France, Germany, Great Britain, Holland, Belgium, Denmark, Norway and Switzerland. The main objective of our expert team has been to respect as much as possible the natural shape of the hoof, providing the best support and protection for the horse while making farriers’ life easier when shoeing. bents of the inside and outside branches follow the physiological shape of most European breeds. A moderate form of sole relief now starts 1mm after the white line. 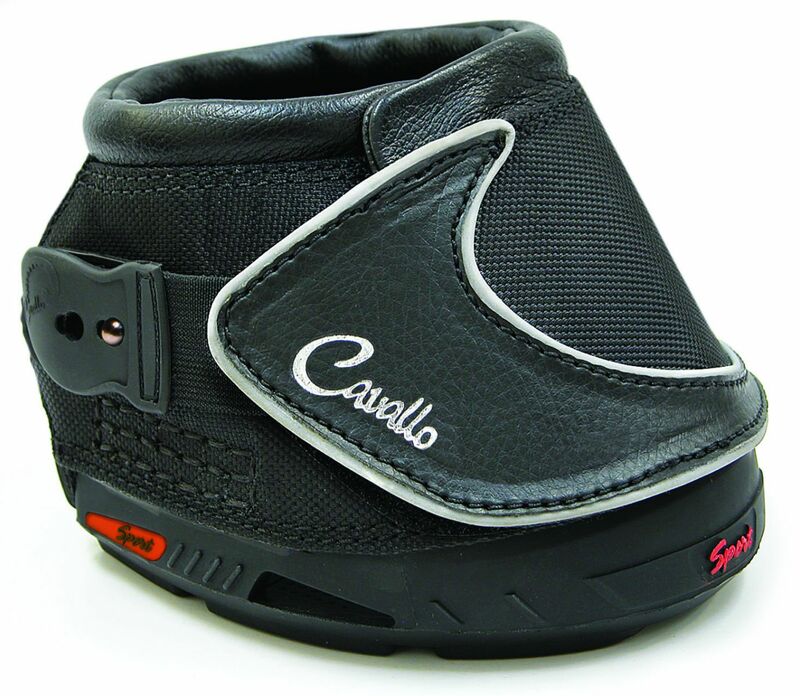 This ensures that no part of the sole will be weight bearing without increasing the risk of a stone lodging between the shoe and the sole. We have learned from experience that as much as 50% of the shoe can be worn away during one shoeing cycle. The consequence of this is that the top half of the nail hole should not be relied upon for shoe retention. We have therefore redesigned the crease and the nail hole in order to guarantee that the nail will always fully seat at the bottom half of the nail hole in combination with Mustad nails. The V-fuller fits seamlessly with most European style standard and long neck nails. Nevertheless we strongly recommend to use it with Mustad Concave or EXL nails for which the shoe have been specifically machine-punched. Although we have retained the traditional character in our model range, we have decided to offer subtle section-to-size variation within the traditional categories of 20x8mm, 22x8mm or 25x8mm. Special attention has gone into sourcing our steel. Our choice of steel grade gives you the right balance between shape-ability on the anvil and durability underneath the hoof. With very low ontent of Carbon and Manganese, we are able to retain our shape-ability even after cooling down in water. No Need to buy Horseshoes in bulk prices from 1 box upwards. 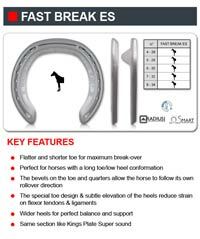 20% discount on our Drop Forged Equi-Shoe range, prices from £17.20 per box. Plus massive discounts on nails. 5% discount on all other products. Just click on the image to the right for further details. Order lines open 8am till 8pm just call Jane on 01246 453672 and get your free samples! Or call round and take a look in our warehouse 9.00am till 4.30pm. Coffee and biscuits waiting! 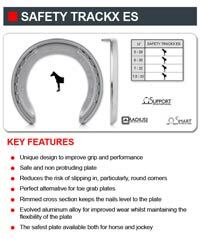 Horseshoes Direct have got another amazing offer on this month with Quality Concave from just £16.90 a box with left and right hand hinds. Now only have to buy 6 boxes to get this amazing discount. We also now stock Mustad ( Concorde ) Aluminium Race plates . Download the flyer by clicking on the image to the right for full details. New items now in stock too! When people started asking him what he had done to his horse to make his coat shine, Martin Matousek was a bit taken aback. “I’m quite a lazy person when it comes to grooming,” he says, “but even we could see what an incredible coat Utopia had”. For Martin, the 10-year-old Dutch warmblood’s coat is just a welcome side-effect for the Swiss show jumper, who rides for pleasure and takes part in up to 20 competitions a year. But having a horse that was always casting shoes was no recipe for success. People started noticing Utopia’s shiny coat soon after Martin started feeding Farrier’s Formula Double Concentrate at the suggestion of his blacksmith. 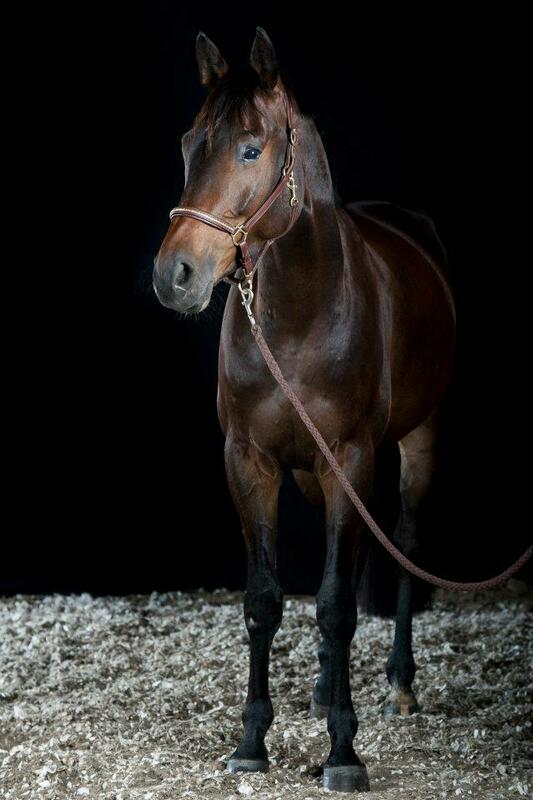 “When I bought my horse about five years ago, he had very poor hooves. His hoof wall kept breaking and he was always losing his shoes.” But within a few months, Utopia’s hoof quality was already much better. A year later, not only had he stopped casting his shoes, but his coat was looking tremendous. Martin was so impressed with the results that he also tried the supplement on his younger horse, Cinedine, a five-year-old Swiss warmblood. A fissure in his hoof had disappeared just five months later. “We’ve achieved fantastic results,” says Martin. “If you consider that a hoof needs about a year to regrow, the effect you can see after about six months are just amazing!” Martin is now feeding Farrier’s Formula Double Concentrate and Barn Bag Adult Maintenance to three horses and is impressed by how well the feed has been accepted. With such a huge choice on the market, it can be hard to find the right product, in Martin’s experience. But for him, his blacksmith’s recommendation has really paid off. “With Farrier’s Formula Double Concentrate you really get what you pay for,” he says. The shine is just the bonus. 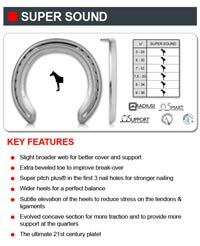 British Concave Horseshoes from only £16.60 a box. No need to buy in bulk, these amazing low prices are available whether you buy 1 box or 50 boxes. Just give Jane a call for a free sample 8am till 8pm on 01246 453672. Click the image to the right to check out the full list of sizes and prices. 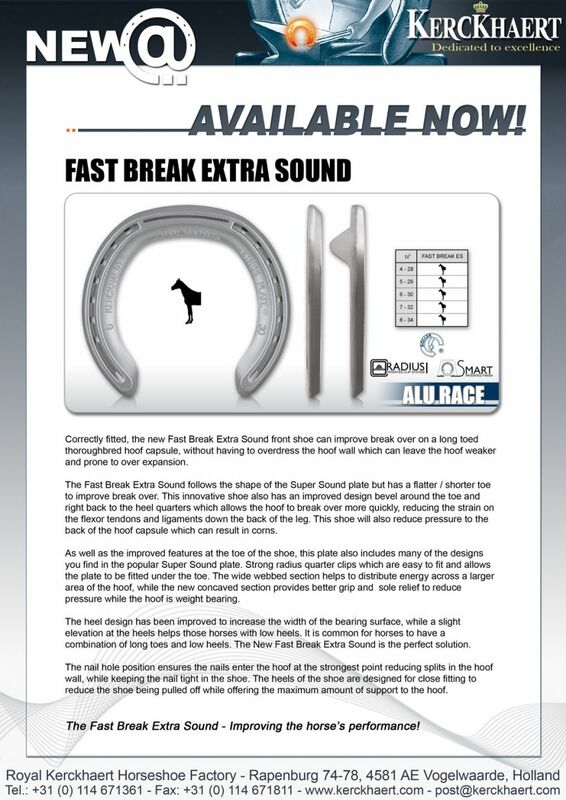 Fast Break Extra Sound, a front shoe that can improve break over on a long toed thoroughred hoof capsule. Details of both of these shoes and larger iamges can be viewed by clicking on the images to the right. The Kerckhaert website (www.kerckhaert.com) has been updated again with some new stuff! 3/4 x 3/8” from £16.80 a box. exc. VAT, 7/8 x 3/8” from £18.40 a box and 7/8 x 7/16” from £20.80 a box. Details of great offers in the Cottam's January Sale have now been released! Click on the image to the right to read more - please note Cottam Concave shoes are from £16.60 per box and Equi-shoes from £17.20 per box! Congratulations to Robert Newman, Mark Hewlett, Richard Alford and Andy Ford - farriers to Champion Flat-racing trainer Richard Hannon - who have won the Victory Magnum for the second year in a row. The Victory Magnum is awarded by Atlantic Equine Ltd to the farriers plating the most Group One winners in Victory racing plates in a season. For 2011, Canford Cliffs was again their flag-bearer, with two wins - in the Lockinge Stakes at Newbury and the Queen Anne Stakes at Royal Ascot, beating, in the latter race, the great French mare, Goldikova. Sadly, Canford Cliffs had to be retired with an injury after running a brave second to the mighty Frankel in the Sussex Stakes at Goodwood. The magnums were presented by Tony Lindsell of Atlantic Equine Ltd. Throughout the season, Richard Hannon was in relentless form with numerous group and listed winners and the outright record of 218 for the number of winners (turf and all-weather) in a calendar year. In the process, he successfully beat off the challenges of the mighty Aidan O'Brien, John Gosden and Sir Henry Cecil yards. 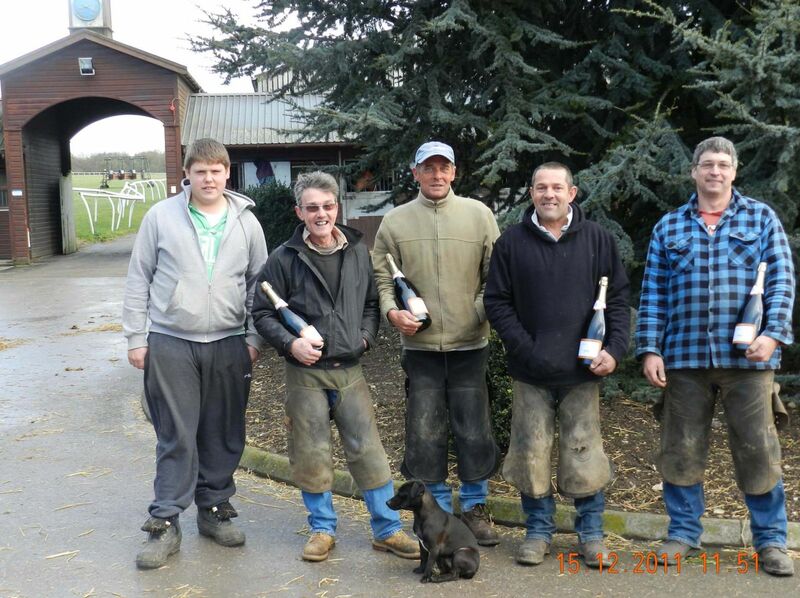 In winning the Victory Magnum for the second year in a row, the four farriers fulfilled their promise of November 2010 - to defend their title successfully. "I told you last year we'd do the double," said Mark Hewlett. "Now for the hat-trick!" They have plenty of horsepower for the task with 140 yearlings coming into the Hannon yard in November, including some from Sheikh Hamdan Al Maktoum for the first time. In shoeing the yearlings, the farriers are assisted by Dan Pinhorn, who has become an essential part of the team.